television, radio, books, and of course, the Internet. Some say we suffer from 'infoglut'. But what is information? The concept of 'information' is a profound one, rooted in mathematics, central to whole branches of science, yet with implications on every aspect of our everyday lives: DNA provides the information to create us; we learn through the information fed to us; we relate to each other through information transfer - gossip, lectures, reading. Information is not only a mathematically powerful concept, but its critical role in society raises wider ethical issues: who owns information? Who controls its dissemination? Who has access to information? 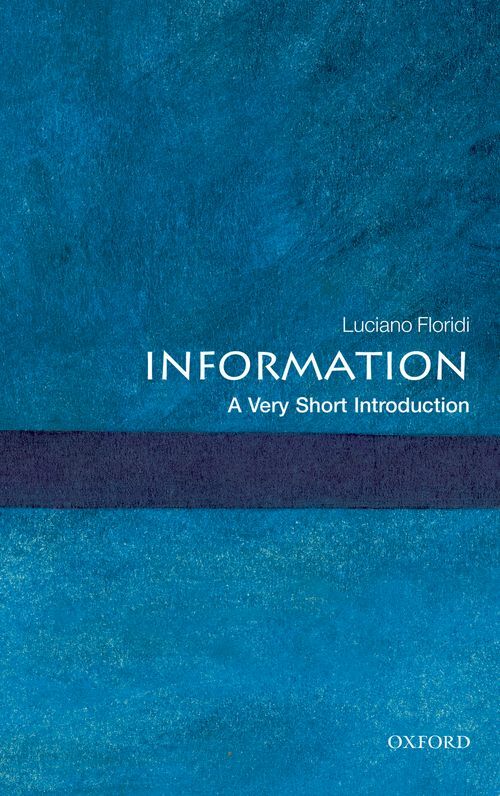 Luciano Floridi, a philosopher of information, cuts across many subjects, from a brief look at the mathematical roots of information - its definition and measurement in 'bits'- to its role in genetics (we are information), and its social meaning and value. He ends by considering the ethics of information, including issues of ownership, privacy, and accessibility; copyright and open source. For those unfamiliar with its precise meaning and wide applicability as a philosophical concept, 'information' may seem a bland or mundane topic. Those who have studied some science or philosophy or sociology will already be aware of its centrality and richness. But for all readers, whether from the humanities or sciences, Floridi gives a fascinating and inspirational introduction to this most fundamental of ideas. Luciano Floridi is the Professor of Philosophy and Ethics of Information at the Oxford Internet Institute, and a fellow of St Cross College, Oxford University. He is the founder and director of the Oxford University Information Ethics Research Group. His research interests include the philosophy of information, information and computer ethics, epistemology and philosophy of logic, and the history and philosophy of scepticism. He is the author of Philosophy and Computing: An Introduction (Routledge, 1999) and editor of the Blackwell Guide to the Philosophy of Computing and Information (Blackwell, 2004).